Veterinary diagnostic imaging includes radiographs (x-rays) including dental xrays, ultrasound, and digital thermal imaging, all of which are used as diagnostic tools to collect information on your cat's health. The vast majority of imaging is non-invasive and completely painless. However, some imaging may require sedation or even anesthesia because the cat must be kept still to allow for adequate images to be produced. Veterinarians use these images to collect information on your cat to help them to make a medical and sometimes surgical plan. After your veterinarian has examined your cat, he or she may want to begin to collect more information that will lead to a diagnosis and then, a treatment plan. 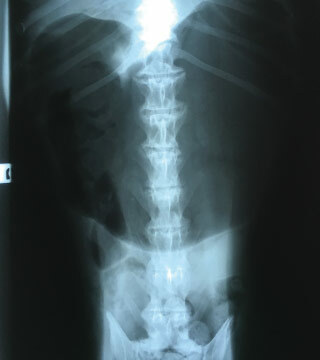 X-rays are usually a first line of imaging. The x-ray may lead to a diagnosis which allows them to move forward with a plan. However, sometimes the next step may be ultrasound to get a more thorough or specific look at a particular area of the body. Thermal imaging gives us a look at the surface temperature of your cat's body, which can pinpoint where inflammation and nerve injury is occurring. In modern scanning systems like the ones Viera East Veterinary Center has on-site and uses on our feline patients, the sound beam sweeps through the body many times per second. This produces a dynamic, real-time image that changes as the cat ultrasound device moves across a cat's body. We can use the results of an ultrasound to determine what is ailing your cat, and to devise the most effective treatment protocol. In many cases of lameness in cats, it is difficult to find painful areas, because cats do not want us to find their "weakness". Sometimes there is more than 1 area that is painful. Thermal imaging utilizes a thermal camera to take pictures of the surface temperatures of your cat's body. Looking for asymmetry when comparing rear legs, front legs, sides of trunk, sides of back will give us a much better idea of where the problem areas are. This enables us to treat these targeted areas more effectively.